SOUNDING MY BARBARIC GULP! 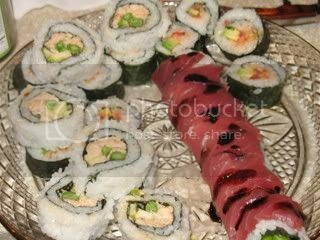 : Allez Cuisine Sushi! Last Saturday, I went to a sushi party with some of the winery people. 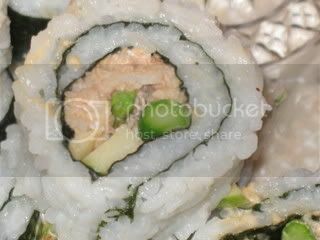 I made miso soup & the sushi rice while Jerad and Ian rolled some delicious and beautiful sushi! The spicy sauce is simply a mixture of mayo and sambal (or Thai chili sauce) to taste with sliced green onions. Bring 6 cups of water to a simmer. Soak 3 tablespoons of wakame (a dried seaweed) in cold water for 10 minutes. Then, add the drained wakame to the water & simmer for 1 minute. Turn off heat. Dissolve 3-4 tablespoons of miso paste in some of the broth, then add it to the pot. Allow to seep briefly before serving. Add a few sliced scallions & diced soft tofu to each bowl and spoon some of the soup on top. Add a few dashes of soy, if desired. NOTE: I used "Hacho Miso", a dark brown paste that made the soup richer & meatier tasting than the kind you get in restaurants.